How do I value & sell my Elvis collection? EIN has published this guide to valuing and selling your Elvis collection in response to the increasing number of requests we receive about these issues. When selling anything Elvis it is wise to have a reasonable perspective about your items for sale and their relative worth. There have been numerous occasions when a fan has been disappointed or vehemently disagreed with a valuation EIN has given them. Some fans have high "price" expectations for "low demand" items. 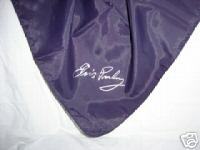 The value you will get for any Elvis item will be heavily influenced by its condition. For example, Jerry Osborne's The Official Guide to Elvis Presley Records and Memorabilia, uses a 10 point grading system ranging from Mint to It hurts to think about it. Obviously, items in Mint condition attract the highest price. For items at the next level Very Good, Osborne states that they are worth between 40% to 60% of the near-mint value! Items considered to be in Good condition are valued at only 10% to 20% of the near-mint value while items in poor or less condition can be worth only 1% or 2% (depending on the item). It is obvious from this, if an item has reasonable wear and tear (eg. scratches on record, torn or dog eared record cover) it may be rare, but its condition means you won't get anywhere near its near-mint value. Having catalogued my own Elvis collection, I know that 99% of it is not particularly valuable and will be very hard to sell, as there is either little demand for it, and/or a glut of similar/same items available. After 35 years of collecting Elvis this is not of great comfort, but it is reality. As a general guide, the earlier the item was released and the better its condition, the higherits value. 1950s vinyl generally attracts a higher premium than 1960s vinyl while 1970s vinyl is generally even less valuable. 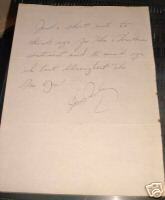 Items released after Elvis' death on August 16, 1977 can be particularly fickle in value. Simply, there were thousands of limited edition collectibles and tribute magazines released and more continue to surface on the major anniversaries of his death. Pre-sale: How do I get my Elvis items valued? This is perhaps the hardest part of arranging to sell your collection. There are limited numbers of fan clubs and rock & roll dealers who know not only "book" values for Elvis items, but also "street" values for Elvis items. 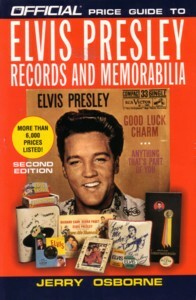 The "book" value is that listed in the numerous published Elvis price guides. The "street" value is the average price actually being obtained at auction or other sale. Often there is a significant difference between the two values. Your local fan club or rock & roll dealer? Your local fan club may be able to help regarding values but check out their credentials to do this. Some fan club officials do not have access to price guides, dealer lists, ebay etc and may only be guessing at an item's worth. Similarly, asking your local rock & roll dealer for a valuation can be problematic. If the dealer suspects you are interested in selling it and he/she is interested in buying it, the value is likely to be well below its true worth. So be street smart. This is mandatory given the large number of Elvis items (many similar) that have been produced. For example, the vinyl album Elvis (first released in 1956) was re-issued eight times up until 1984! The "book" value of different issues varies between US$750.00 and US$15.00, so if a thorough examination of your collection is not done you could either sell an item too cheaply or ask an unrealistic price. To EIN's knowledge there are not many Elvis appraisers around. Professional auction houses will only take the time to research potentially very valuable items while most fans have a large collection of not so valuable items. If you find them, ask to speak with some of their previous clients. There are numerous Elvis price guides which have been published over the years. Please note that many items actually sell for a lot less than their book value in response to supply and demand factors. It is sometimes a sad reality that due to the huge number of Elvis items manufactured (records, CDs, books, DVDs, videos, collectors plates, jewelry, busts, trading cards etc), there is a glut of Elvis items for sale. A quick "Elvis" search of ebay.com will not only confirm this for you but provide an indication of which items are sought after and what prices are being obtained. Many of the guides listed are quite out of date and depending on the rarity of the item the present day value may have increased, decreased or remained steady. For instance the value of original Sun singles in Very Good+ condition continues to climb while the value of limited edition collectors plates is falling (there are around 250 collectors plates now on the market, each new one diluting the value of most others). Some of the guides can be found through online booksellers (amazon.com; bn.com, bamm.com) either in new or used condition - don't forget to look for used copies which are often considerably cheaper to buy than new copies. This is a list of some of the Elvis Price Guides on the market which may be of help to you. Collect!, Fry Communications, USA - The August 1999 (featuring pro-wrestler, Sable, on its cover) included values for a range of Elvis trading cards and collectors plates. Elvis In Print: The Definitive Reference & Price Guide, Nigel Patterson - scheduled book release listing details and values for more than 3,000 books and magazines about Elvis published around the world. Elvis In The Post Catalogue and Guide to Elvis Presley International Postage Stamps, Jo Woodward, TCB Publishing, UK, 1997, Softcover, Illustrated, ISBN: 0953060101 - British release showcasing a good range of memorabilia with UK values. Goldmine Price Guide to Rock 'n' Roll Memorabilia, Mark Allen Baker, BPI Communications Ltd, 1997, USA, Illustrated, ISBN: 087341490X - broad listing of Elvis items from 1956 anklets toautographs, film memorabilia and concert tickets. The Official Price Guide to Elvis Presley Records and Memorabilia (Second Edition), Jerry Osborne, House of Collectibles/Ballantine Publishing Group, New York, 1998, Softcover, Illustrated, ISBN: 0676601413 - USA only guide but includes geat detail on Elvis vinyl and comprehensive info on official CD releases and general memorabilia. Presleyana IV The Elvis Presley Record Price Guide, Jerry Osborne, 1997, Softcover, Illustrated, ISBN: 0932117260 - for fans needing a more detailed guide to Elvis' American official vinyl releases. Elvis Presley Memorabilia An Unauthorised Collector's Guide with Price Guide, Sean O'Neal, Schiffer Publishing Ltd, USA, 2001, Illustrated, ISBN: 0764313827 - comprehensive listing of items from Elvis in Concert to novelty items, one-of-a-kind, magazines, vinyl and autographs. The Elvis Catalog, Lee Cotten, Dolphin/Doubleday, 1987, USA, Illustrated, ISBN: 0385237049 (softcover edition) - while now seriously out of date "price wise", nevertheless a broad record of Elvis memorabilia up until 1987. 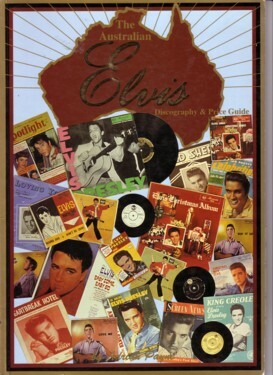 Elvis Collectibles, Rosalind Cranor, The Overmountain Press, USA, 1987, Softcover, Illustrated, ISBN: 0932807224 - comprehensive range of Elvis items released up until his death. See next listing. Updated Price Guide to Elvis Collectibles, Rosalind Cranor, Steve Templeton and Ted Young, The Overmountain Press, USA, 1992, ISBN: 093280781X - slimline edition with updated values for items in the original 1987 release. Elvis Presley La discographie francaise, Jean-Marie Pouzenc, Elvis My Happiness Magazine, 2002, Softcover, Illustrated, ISBN: 2951394217 - impressive production showcasing Elvis' vinyl and CD releaes in France. 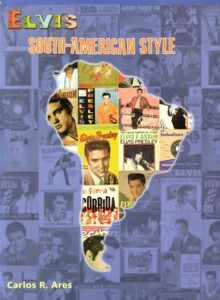 Elvis South-American Style, Carlos Ares, Argentina, 2000, Hardcover, Illustrated, ISBN:9879519612 - with some glorious photos, this is the best discography and price guide for Elvis vinyl, CD and printed items principally from Argentina, Brazil and Chile. Elvis In Brazil (Catalog & Photo Book), Vivaldo P.S. Filho, Elvis Today Fan Club, Brazil, 1989, Softcover, 46 pages, Illustrated - combination record price catalog and photo-book with blurry photos from the archives of Jim Hannaford. Viva Elvis The Ultimate Discography and Record Price Guide from Argentina, Carlos R. Ares, C.A. Productions, Argentina, ISBN: 9879519604 - Carlos Ares' original discography and price guide which was expanded in 2000 for his Elvis South-American Style release. The Australian Elvis Discography & Price Guide, Adrian Payne, Black Crow Music PtyLtd,1995, Softcover, Illustrated, ISBN: 0949203262 - the original Aussie price guide. Only covers vinyl releases and a select range of printed Elvis publications. Long out of print and hard to find. Australian Collectorholics Magazine, Mat and Diane Maurer, Australia, Softcover, 64 pages, Illustrated - Published in the late 1990’s, the November 1998 issue (volume 1, issue 5) included a two and a half pages color, cover story ‘Elvis Presley 50 Million Fans Can’t Be Wrong’. The emphasis was on 1950s Elvis collectibles. How do I go about selling my Elvis items? There are a number of avenues open to someone wanting to sell a few items in their collection or their whole collection. Your local fan club may be able to help but it may also suffer from a small membership base and lack of a wider network to market your items to. Placing an advertisement in the local newspaper can work but is recommended only for ordinary items, not those with significant value. Many cities also have book and record fairs where items can be sold or traded to "dealers". The downside of this is that dealers will only offer you a fraction of the item's true value. They are, after all, often running a business. Similarly, there are several well known Elvis collectors/dealers who may be interested in buying some or all of your collection. A number of these can be contacted through a simple Google search. However, like rock & roll dealers, they are unlikely to offer you more than a fraction of the true value of your items. The Internet has revolutionised how many Elvis fans are selling their Elvis items. In particular, ebay.com provides fans with a cheap and easy means of marketing their Elvis collections to a global audience. If you have a particularly valuable item(s) or collection (eg. original Sun singles, items of Elvis' personal clothing or other possessions, genuine Elvis autographs), using a professional auction house to sell your items is advisable. In recent years there has been an increase in the number of Elvis items turning up this way. If you only have a run-of-the-mill Elvis collection it is unlikely a professional auction house will be interested in selling your collection. Note: ebay is by far the most successful online auction facility - apart from the parent site ebay.com, the organisation has established many "country specific" subsidiary sites eg. UK, Australia, Germany,France, Japan. While there are other local online auction sites in many countries EIN recommends you expose your items to the biggest possible pool of potential buyers.